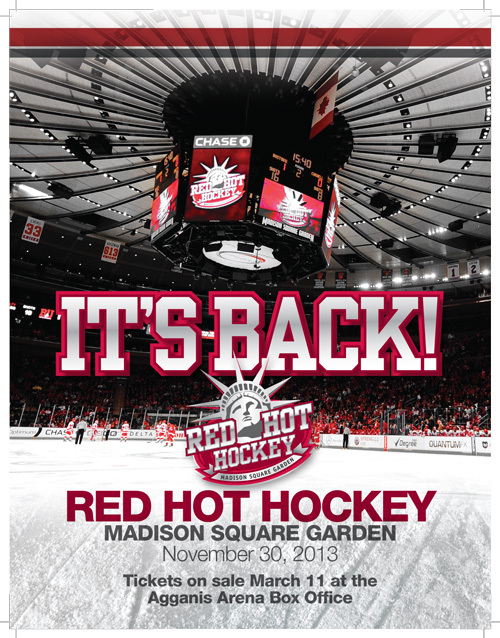 Red Hot Hockey is an event that pits two perennial college hockey powers, Boston University and Cornell University, on the grand stage of Madison Square Garden in New York City. 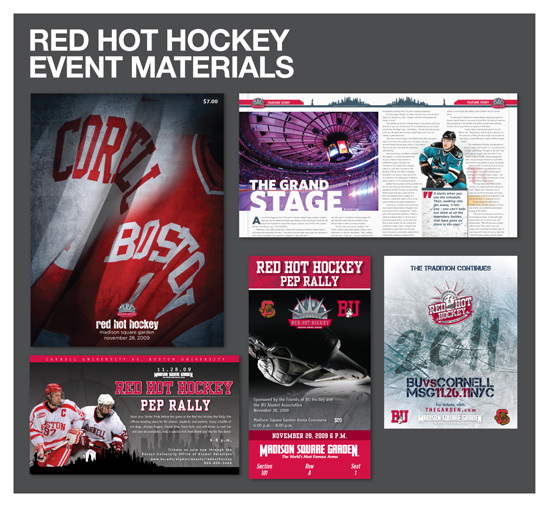 I’ve had the privilege of working on the marketing materials for the Red Hot Hockey events which took place in 2007, 2009, and 2011, and will do so again in 2013. Not only was the initial Red Hot Hockey game the first collegiate hockey game to ever sell out the renowned 18,200-seat arena, but the 2009 and 2011 editions also managed to fill the building to capacity. We even had the Stanley Cup on hand in 2011 as an added experience for the fans. Red Hot Hockey is easily the highlight of my career as far as involvement in a project because it combines my love for creativity with my love for hockey. I get to be involved in a lot of aspects of the event, including marketing and managing the event’s social media presence. (Shameless plug: @redhothockey on Twitter). The Madison Square Garden staff are great to work with and the entire event couldn’t happen without the tireless work of Becky Collet, my former boss at BU, who I still collaborate with as part of Collet Communications. I’ve waxed philosophical on the redesign of the RHH logo before, but seeing your work up on the scoreboard in an arena with 18,200 people clad in red is a sight that just won’t ever get old. You can see some more of my RHH work by checking out my full portfolio. Cheers.